Bach or holiday home, 2 Bedrooms, 1 Bathrooms, (Sleeps 6) close to the beach. A short stroll to the beach, safe swimming, surfing, good fishing, boating, kayaking, diving, relax at the end of the day with a BBQ on a large private fenced section. The bach has 2 spacious bedrooms, one with a Queen bed and the other one with a Queen bed with a king single bunk beds, 1bathroom shower, outdoor shower (running on cold water) open plan living area, and many outdoor or indoor games. Situated few minutes drive to Whitianga town, shops, and restaurants, Lost spring hot pools, public swimming pool (supervised during school holidays), museum and man other activities. Drive 10 to 40 min to some fantastic beaches, Hot water beach well known for the hot pools, Hahei town with a fantastic trip to Cathedral Cove an amazing marine reserve ideal for snorkelling, Otama beach and it's lagoon offer a safe warm place for the whole family to swim, Opito Bay calm beach have a quiet walk, Kuaotunu fantastic beach where the dolphins might come for a visit, while you there have a pizza at Luke's kitchen (booking essential) Matarangi well known for one of the most beautiful 18 holes golf court in the world, New Chums beach take a picnic to discover a hidden beach where mother nature makes magic, you can even stop at the end of the day for ice cream at the dairy. Discover the beauty of the 309 Road, native trees and great water holes, for a river swim, it's 309 manuka honey, the water garden, the Kauri Grove walk for a 1 hour tour of fantasy, become a tree hugger and if you are a bit more sport go to the top of the world Castle Rock it's a good day trip, finish it to discover the hidden waterfall. For the dog lovers, Brophys beach is a place to go, A 15 minutes safe walk. The whole Coromandel offers a wide range of arts galleries, craft shops, markets, music and food festivals, for the children a discovery to be close to nature visiting small farms, bird watching, butterflies and be a hero visit the activities park on the kaimara Road or drive to the picturesque town Coromandel, and many other touristic places and activities. Pets allowed with prior approval with the owner only, dog owners must show a photo of the dog and a photo of the registration. Tenants must specify If bringing a boat. We have always loved to come to Simpsons Beach for a swim, the best beach beautiful and safe. Fully contained Bach, 200 metres away to the beach. Fully equiped and private. toilet, tub, shower, outdoor shower, Outdoor shower running only on cold water. or save and bring your own. You may find some salt and pepper and other things left behind by other guests. We had a lovely stay. Wharekaho beach is stunning and the bird life is amazing. Great bach, had everything we needed for our stay. Great quiet location. Easy walk to the beach. Lovely clean and tidy place. Highly recommended. This Bach is lovely. 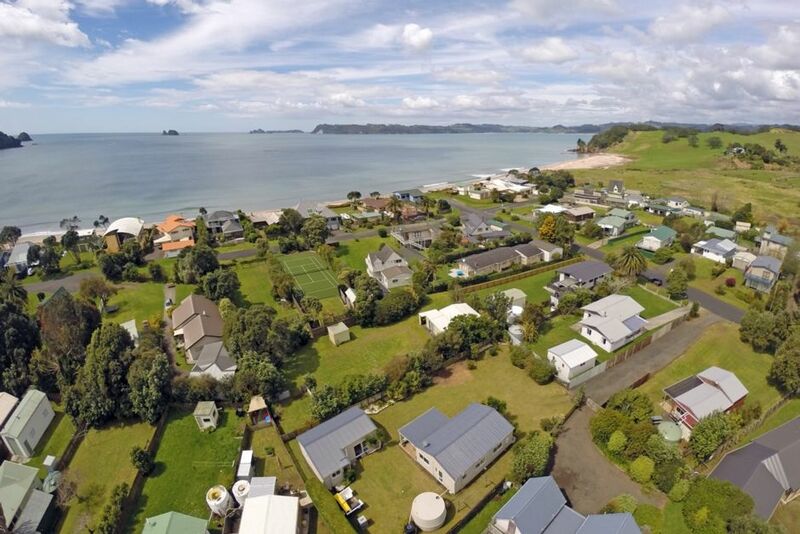 The location is fantastic... very close to the beautiful Wharekaho beach, and a very short drive to the shops and restaurants of Whitianga. The house itself is well- equipped, and there’s even a private suite in the garage with its own washroom. Great little bach. Location is awesome, secluded in stunning little Wharekaho Beach but only 5 min drive to Supermarkets, shops etc. BBQ and outdoor area perfect for summer nights. Loved our stay here. A little gem on the coromandel. 200 meters walk from the beautiful Wharekaho Beach.